Food History Jottings: A Culinary Chatterton? One of the most useful resources for scholars studying the food and domestic medicine of the seventeenth century is the collection of digitised cookery manuscripts on the Wellcome Library website. The library's policy of open access to its manuscript collections through high quality digitised versions is truly groundbreaking and anyone who is unaware of this resource should take some time to explore it. The American pharmaceutical magnate Henry Wellcome (1853-1936) started seriously purchasing books related to the history of medicine in London in the 1890s. The scope of his collecting was wide and included subjects ancillary to medicine, such as diet, nutrition, cookery, alchemy, ethnography and even witchcraft. Since Wellcome's death, the library has energetically continued to augment the collection with an ongoing acquisition programme. Over the years I have consulted many of the Wellcome's recipe manuscripts. The collection includes a number of national importance, such as those of Lady Ann Fanshawe, Hannah Bisaker and Edward and Katherine Kidder. However, one very small manuscript has puzzled me for a long time. This volume consists of just 5 leaves of vellum. The front board has the title 'Herbes to season. herbes to cure'. On the paper lining inside the top cover in red ink is written the name 'Grace Acton, May 1621', presumably that of a previous owner. The manuscript was purchased in 1931, probably by one of the many book dealers who acted as Mr Wellcome's agents. It has the accession number 75906 and is entered as MS.1 in the catalogue. The very first time I examined this slim volume it reminded me immediately of something from my childhood. When I was a kid I was very keen on playing at pirates - you all know the game - the eye patch, homemade wooden cutless and knotted headscarf etc. One other essential prop was a tattered map of a tropical island, usually marked with an X signifying the whereabouts of a buried chest full of treasure. Since I was the artistic one in the gang, I was always given the job of drafting out the map. I remember even once taking the trouble of using a quill pen to draw one. When completed, I would 'antique' it by crumpling it up, rubbing some dirt into the paper and sometimes even burn the edges with a lighted match. My fake maps were much admired by my pirate friends. So when I first opened 'Herbes to season. herbes to cure', I thought this is just like one of those fake pirate maps I used to make when I was about ten years old. The more closely I examined MS.1, the more I was convinced that it was a fake. The handwriting seemed to me a kind of pastiche script rather than a genuine hand. It was far too easy to read and was an entirely different hand from that which had penned the signature of Grace Acton on the inside front cover, which seemed to be genuine. But it was the recipes and the language in which they were written that appeared most suspect. I began to think that maybe the book was a prop from an old Carry On film, perhaps 'Carry on Banqueting'. Though some of the medical remedies read like they had been lifted straight out of a Harry Potter movie. Yes, hedgehogs, asses' milk and hares' tails all crop up as ingredients in early remedial receipts, but their juxtaposition in the recipe below just did not convince me. And just look at that terribly clumsy faux period handwriting. Many genuine early medical recipes include outlandish ingredients such as ground woodlice, powdered Egyptian mummy, man's urine etc., but who is the author of this remedy for bed wetting trying to kid? 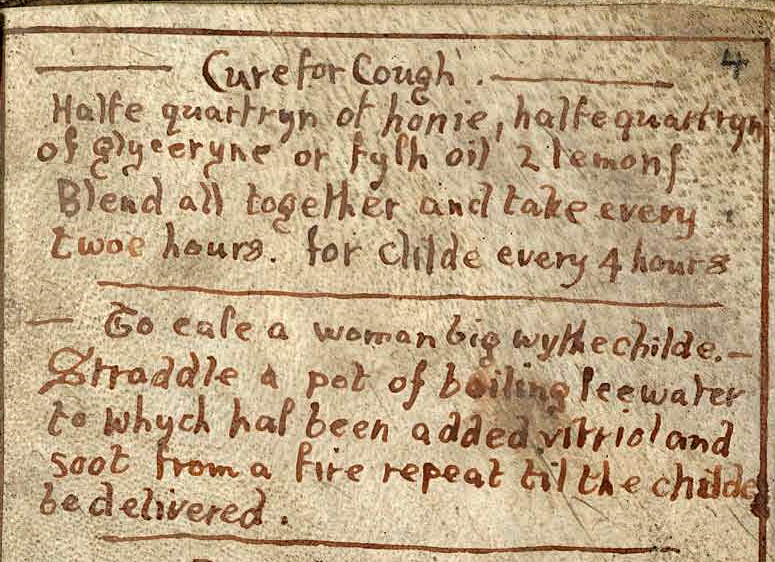 The same could be said for the recipe below for curing a wen in the neck. A wen was a name for a scrofulous sore, tumour, wart or any other lump on the skin. All the medicinal recipes in this small collection contain outlandish ingredients like adder's tongues, mice and hedgehog lard (yes, I know there is a plant called adder's tongue, but that is not meant here). It is possible that these recipes have been extracted from an original source, but if this is the case it is the nature of the selection that makes me think that the author was trying to impress his readers with the bizarre and comedic nature of his ancient remedies. However, if any of you have seen any of these specific formulae in other texts, I would be interested to hear from you. In the cough remedy below a half quartern of glycerine is called for. This is a suprising ingredient to find in a seventeenth century recipe as it was not discovered until 1779 by the Swedish chemist Carl Wilhelm Scheele. According to the OED, the earliest usage of the word in the English language was not until 1838. By being a little careless our author has been rumbled - the manuscript is definitely a pastiche. Interestingly, a linctus made from lemon, glycerine and honey is still available from Boots and other pharmaceutical outlets. Does anyone know about the origin of this popular remedy? 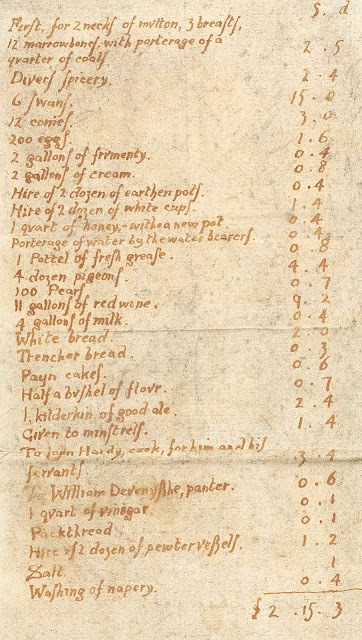 This is quite convincing as it is typical bill of fare for a high status English meal of the 14th or 15th century. There are extant recipes for all of these dishes in 14th and 15th century manuscripts. 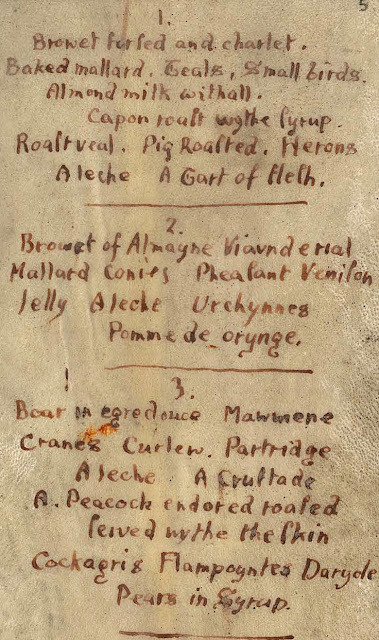 The boar in egredouce in the third course is particularly interesting because there is also a full recipe for this dish in the manuscript, which is below. 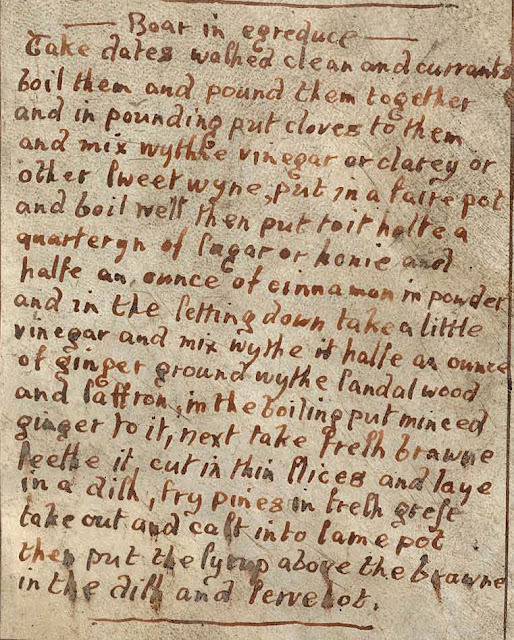 The source for this is almost certainly a transcription of a medieval cookery manuscript published by the Society of Antiquaries in A Collection of Ordinances and Regulations. London: 1790. p. 459. The original source manuscript was in the Library of the Royal Society, Arundel Collection, N.344. p. 27-445. 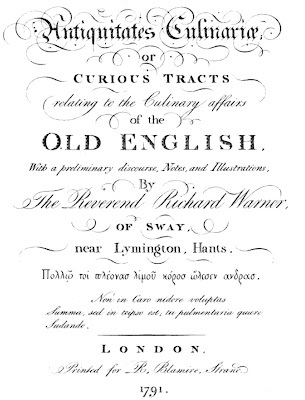 This collection was published again the following year by Richard Warner in Antiquitates Culinariae. London: 1791, p. 79. Warner copied the text directly from the Society of Antiquaries' book. Other medieval cookery manuscripts have recipes for this dish, but it is usually called brawn or browne in egurdouce. The spelling boor in egredouce seems to be unique to the Arundel Collection manuscript. This makes me think that the author of MS.1 gleaned his or her knowledge of medieval cookery either from a copy of A Collection of Ordinances or Warner's Antiquitates Culinariae. As you can see by comparing Warner's text, the wording of the recipe in the Wellcome manuscript is slightly different, as is the spelling of 'boor' as 'boar', but it could be based on the Arundel recipe, though as a paraphrase with some of the Middle English words modernised. 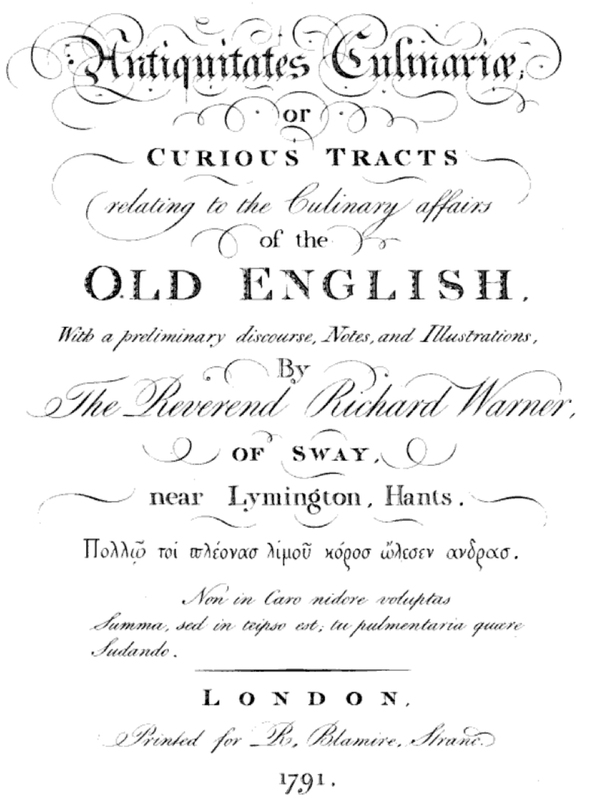 The title page of Richard Warner's Antiquitates Culinariae, a possible source of some of the recipes in MS. 1. There are other recipes in MS.1. which may be based on ones in the Arundel text, including one for serving a peacock in its skin and another for leche lombard. The novelty dish normally known as a cockentryce is called a cockagris here and is mentioned in the third course in the bill of fare. This exact spelling is unique to the Arundel manuscript, so I expect our author found it in The Collection of Ordinances or Warner. Nearly all of the cookery recipes are based on medieval sources. One however for a syllabub is more typical of the early modern period. Perhaps the author found an old notebook with a number of leaves of blank vellum and wrote the text in a fake hand in order to pretend that this was a book of ancient recipes. The notebook may have belonged to a Grace Acton, or perhaps the faker has used an old binding to use as a cover for his manuscript which conveniently had her name in it. I am certain that whoever wrote the book had access to a copy of A Collection of Ordinances, or maybe Warner's book. As to when it was composed the occurrence of the word glycerine is the best clue - so any time between 1834 and 1931, but certainly not 1621. Again the style of the language is more like that of a Sir Walter Scott romance than of a genuine early modern period cookery book - 'Divers spicery', '1 Pottel of fresh grease', 'Porterage of water by the water bearers'. '1 kilderkin of good ale' and 'Given to minstrels - 1.4' are all too corny to be true. The feel of this text is like that of a Victorian village pageant, or one of those rather cheesy and inaccurate medieval re-enactments. Perhaps the whole thing was written by Baldrick for an episode of Blackadder which was never broadcast. I often wonder who it really was who put this little collection together and their motivation for doing so. It always makes me think of the story of Thomas Chatterton, the Bristol teenager who faked medieval manuscripts of poetry in the 1760s. Perhaps there was once a culinary Chatterton. If so, the last laugh was certainly on him, because he fooled the antiquarian book dealers of the 1930s. The manuscript has also been scrutinised by many experts since, but none so far have questioned its authenticity. I would like to thank Helen Wakely, Archivist at the Wellcome Library for allowing me to publish the pages from Wellcome MS.1. All these images are © The Wellcome Foundation. Excellent detective work. It would be very interesting to know why this was done. A Flayne Mouse rosted, or made in powder, & drunk at one tyme, doeth perfectly helpe such as can not holde or keepe their water: especially, if it be vsed three dayes in this order. This is verie true and often proued." So the author seemed to have some idea of the literature. 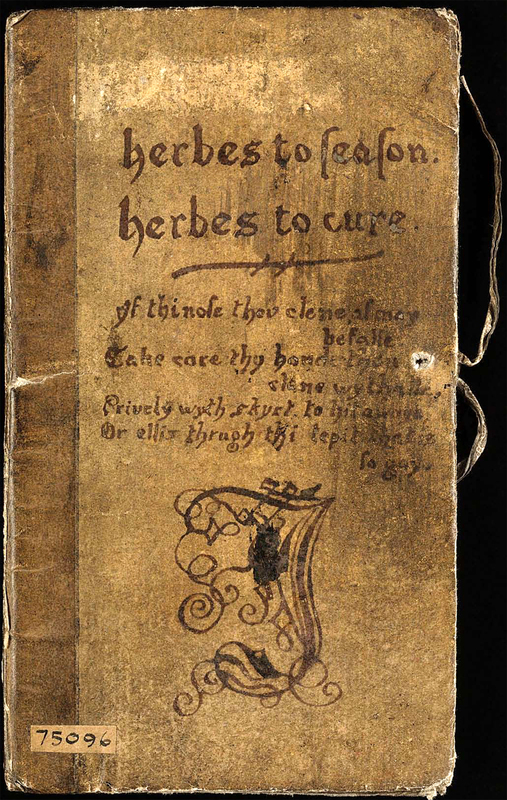 medical and culinary, so why add all the Shakespearean witch's brew ingredients? So if it was ment to be a fake, why isn't it a better fake? The orthography and hand of this delightful little book are also not of the period --it looks to me like a nineteenth-century imitation of an antique print hand, made by someone who was quite used to both the italic and cursive forms of Victorian times, and attempting with the adding of squiggles here and there to give it an "antique" look, much like your pirate maps. But what of "Grace Acton"? That inscription shows a common variety of later "secretary hand" which could very plausibly have been written when it says. I wonder whether, in the tradition of other forgers, the writer of this little book made use of some vellum which contained that inscription, the more to give authenticity to the additional text? Thanks for this! When I looked at the book several years ago, I wrote in my notes that the handwriting looked suspicious, but I never pursued it further. After reading a couple of random posts, I'm starting to read all your posts in alphabetical order as displayed on the site. Starting with this one has confirmed to me that I have stumbled upon an exceptional historical blogger on my favorite subject: food. This will be an absolute treat!! Thank you so much for sharing your hard work here.